Cerio dislocated both of her knees during an NCAA regional semifinal in Baton Rouge, Louisiana this month. An Auburn University gymnast who suffered career-ending injuries to both knees says her goals now include walking down the aisle at her upcoming wedding. Samantha Cerio, an aerospace engineering major from North Carolina, also is preparing to graduate and has accepted a job with Boeing as a structural design analysis engineer. Cerio, 22, discussed her future plans in an interview with NBC's "Today" show that aired Monday. 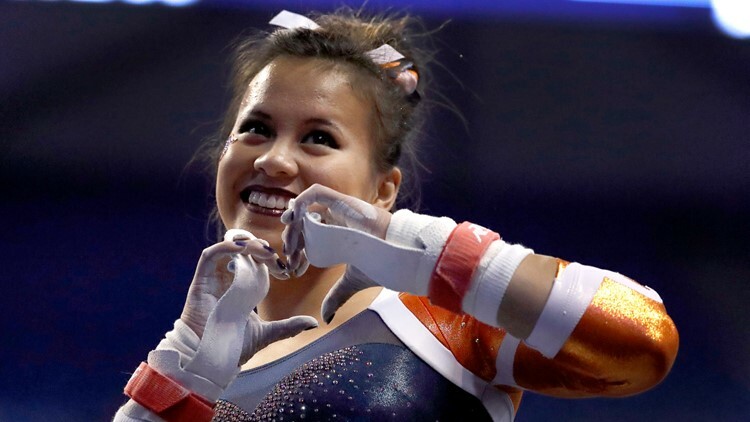 Auburn's gymnastics coach said Cerio suffered dislocations and torn ligaments in both knees in a gruesome injury during an NCAA regional semifinal in Baton Rouge, Louisiana, this month. She has tweeted against people sharing the video, writing that her pain is "not your entertainment."